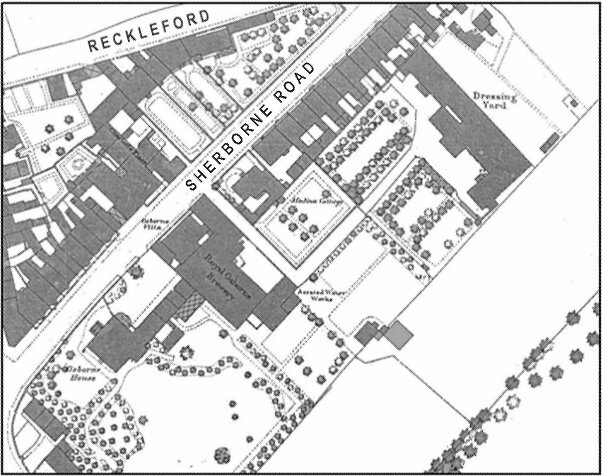 Medina Cottage was a large residence with an equally large garden next to the Royal Osborne Brewery on the south side of Sherborne Road, about halfway between Wyndham Street and the new one-way junction with Reckleford. In the 1871 census it was occupied by retired chemist Thomas Manning, his wife Sarah and a general domestic servant. Medina Cottage ultimately (after 1881) became part of the adjoining Duke of Wellington public house and was demolished in 1992. The site is now the car park in front of Majestic Wine. Map based on the 1886 Ordnance Survey. Medina Cottage and its grounds are at the centre of the map.